January is coming to an end, and I thought it would be a good time to review the metadata panel in Lightroom to make sure you have your current 2017 copyright data embedded in your image. The metadata panel is found in Lightroom’s Library module, where you can find lots of information about your image file, including the dimensions, date taken, camera and lens used, etc., as well as where you can add copyright data to the image file, stating that you are the image creator and that it is a copyrighted photo. This is useful if you’re providing digital images to clients or stock photo agencies, or sharing your images in online galleries, like Flickr, SmugMug, 500px, etc. Lightroom makes it easy to apply this standard copyright and contact information in the metadata with the use of metadata presets. What metadata should I include? At a minimum, you should set your copyright status and details, including the year and your name, and any usage terms. Even if you aren’t in business, if you take a photo, you own the copyright to it. This isn’t restricted to professional photographers. Marking an image as copyrighted just signifies that it is not being shared for the public domain for anyone to use how they wish. It is also a good idea to also include your contact information including your email address, and web site if you have one. You can also include your full name and an address and phone number if you wish. This contact information allows someone to reach out to you if they are interested in getting your permission to use your photo or even purchase usage rights. The copyright and contact information can be saved in a preset, and then applied to your images on import so you don’t even have to think about it again. I just recommend updating your preset or creating a new preset each year so that you have the current copyright year for each photo. Set a reminder in your calendar to update this on January 1st of each year. Metadata also includes a title, caption, and keywords to your image. This will typically differ from image to image, so the presets aren’t as helpful, but if you find yourself re-using the same keywords for a subset of your photos, you can create multiple metadata presets and apply them as appropriate. For example, I like to keyword my photos with the current year, so each year, when I update the copyright year in my metadata preset, I also update the year in the keyword section of the metadata preset. While this data is retained when emailing files or uploading to many online photo galleries, it is often stripped from social media sites, includes Facebook and Instagram. It is not meant to offer complete protection, but it is best to have the copyright metadata included for sites and uses that do retain and display the information. Metadata presets are quite easy to create. 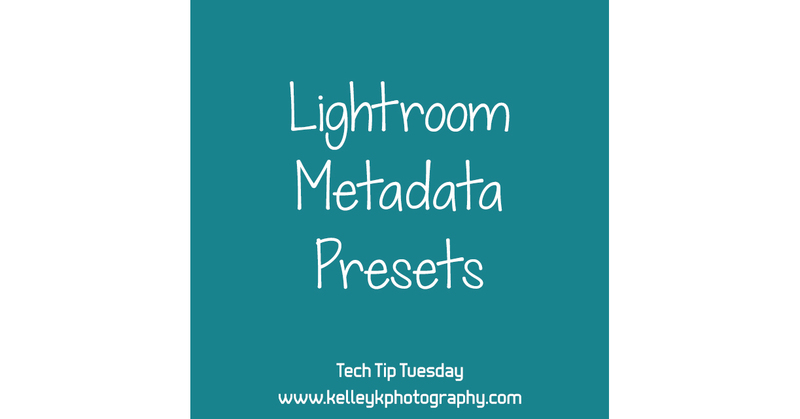 In Lightroom, go to the Metadata section in the right side of the Library panel, and select “Edit Metadata Presets” from the Preset drop-down list. The fields in red and checked are the ones that I use. This is what the Copyright and Creator sections look like when I have them filled out. Then in the keywords field at the bottom, I just add “2017”. When you are done typing your copyright and contact information in the desired fields, click the “Check Filled” button at the bottom, and then make sure none of the other sections are checked. The only fields you want checked are the ones that should be saved with the preset. Then click Done, and it will prompt you to Save the preset. You can give it a name like “2017 Copyright”. Or if you wanted to include more specific keywords, such as a newborn photographer who wants to add “newborn, baby, infant” for all client photos, you could add that detail to the name, like “2017 Newborns”. Putting the year in the metadata name serves as a reminder that it should be updated each year. How do I use metadata presets? When importing images, choose your metadata preset from the Metadata drop-down on the right, in the section, “Apply During Import”. This will assign the metadata to your image when you bring it into Lightroom. When exporting images, in the Metadata section, you can choose how much metadata to include in your exported files from a drop-down field. It is up to you how much information you would like included in your exported images. You can also use the checkboxes below that drop-down box to specify if person and location info should be removed. Do i have to select “apply during import then check Metadata each tome i import? or is there a way to make my choice a default so every import has my copy write attached? The Lightroom import window automatically remembers your previous settings and loads them next time you import, so I usually only have to change this drop-down once a year. You can also save an import preset if you want to save a group of import settings. This option is at the bottom center of the import window.